Designed for Preschool and Special Needs Audience! 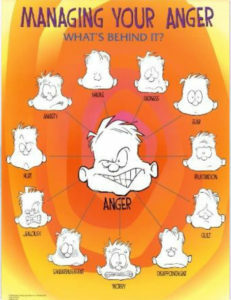 Our original poster designed to help students identify their emotions! Children can match the drawn faces to real-world expressions to better understand emotions. A visual tool to help students pinpoint the source of their anger and work toward self-regulation and conflict resolution. 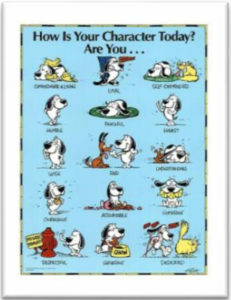 A loveable dog models qualities of good character to promote positive behavior in young children. 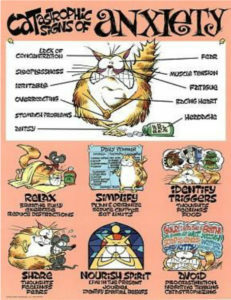 This cartoon cat portrays the physical characteristics of anxiety to help students recognize and cope with their feelings. Creative Therapy has been in business for over 25 years. Beginning with the now famous Feelings Poster, also sometimes referred to as the Emotions Poster, we have expanded our line to include: Stress, Depression, Multiple Intelligences, Anxiety, Anger Management, Abuse, Bullying Character, Recovery, Dealing with People and Self Esteem. 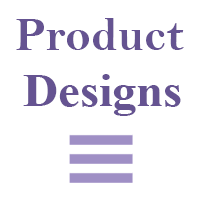 Our posters are considered contemporary and decorative art. 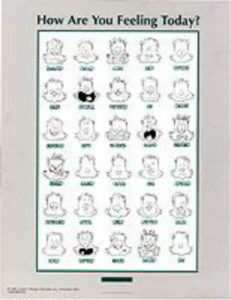 Our Feelings and Self-esteem posters were illustrated by Pulitzer Prize winning artist, Jim Borgman and Tom Holtkamp. 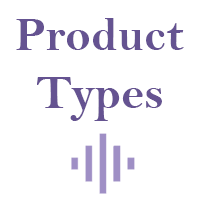 Many of our items can be customized such as our Mood Magnets and T-Shirts for your business or organization.